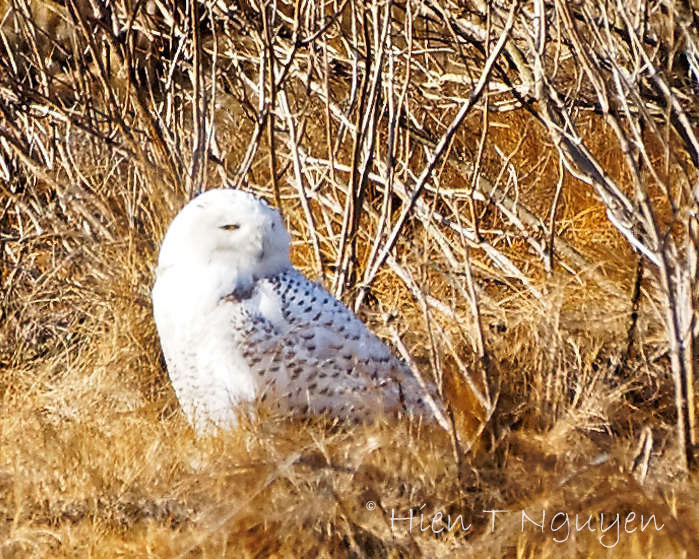 I photographed my first Snowy Owl in December 2013, and again in January 2014 and 2015. Then for two years in a row, it made itself scarce. There were reported sightings in New Jersey, but every time I went to those places it was nowhere to be seen. 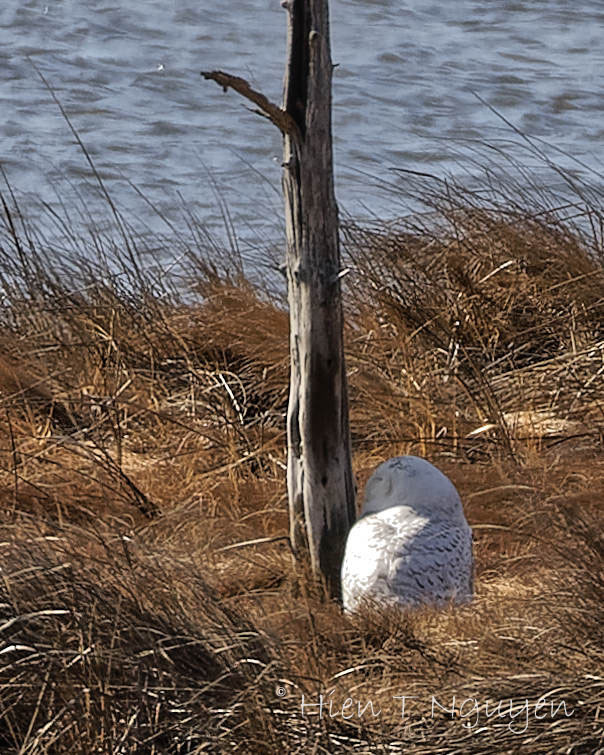 This past Sunday, there were two Snowy Owls at the Edwin B Forsythe National Wildlife Refuge. However, they were quite far, and there was no way to come nearer to them. I had to crop as much as 90% of the images, and the final results are disappointing. Update: the banner image is from a photo taken in 2015. I completely understand the issue of distance, but these are still good pictures of this beautiful bird! A belated thank you, Helen! I’ve read that there are sightings as far south as Washington DC. and there is a lot of pressure on these shy birds from people wanting to see one. It is a tough situation and hard to monitor. Fortunately, most birders are respectful. You are right Eliza, about pressure from people on these owls. On this particular day, one of the owls finally had enough and hid itself behind a bush. Meanwhile, there were at least half a dozen photographers with heavy tripods and big long lenses pointed at that spot waiting for it to reappear. I don’t know if it ever did because I left since my lens was under-powered for that big distance. Must be their rarity. I haven’t read any of the Harry Potter books, or seen the movies, so can’t comment on that aspect. A beautiful bird that I don’t get to see at all. Great capture, Hien! He’s marvelous. I love his plumage. It was quite windy in your second picture. They are both lovely shots even though you were a bit disappointed in not being able to get closer. Thank you! Maybe I’ll get another chance before they decide to fly back to the Artic. But you saw it! And the second photo is quite interesting, in an odd way. I saw my first Snowy out at Jones Beach back in the 70’s. Before the days when people flocked to see birds – no internet! I think we just came across it. It was very exciting. I’m sure you’ll have more chances for closer views. Thanks Lynn! Seeing two of them not too far from each other was indeed quite a treat. The photos might not be what you would have liked, Hien, but I am sure you were thrilled with your terrific find nonetheless! You are right of course. After two years of not seeing them, it was a pleasant shock to see two of them in one day. I think they are beautiful, also, Hein. Such pretty birds. Thank you very much Lois! I think that the images are just fine. They’re such beautiful birds, I’m glad that you had a chance to see them again. You are too kind, Jerry. I remember when I was able to get within 30-40 ft of a Snowy Owl. These two were about 100 or more yards away. I think they are beautiful photos.